The Evil TrilogyDespite growing up together in their trendy Beverly Hills neighborhood, three best friends hide dark childhoods. The lives of Kit, Baylee and Quinn have been anything but perfect. Little do they know a stranger is about to unravel long, buried secrets, bringing the past back to life with a vengeance. 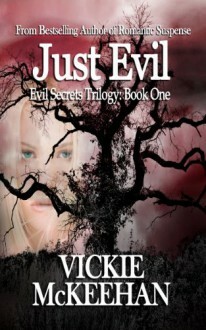 Just Evil Kit Griffin has finally overcome a painful childhood at the hands of her mother, former actress Alana Stevens. No longer living in the grasp of the cold, tyrannical woman, Kit's life is finally on track. That is, until Alana is found brutally murdered on Mother's Day, pulling Kit back to the dark horrors of her past. To make matters worse, the police consider Kit the prime suspect. Jake Boston is an old family friend and the man Kit has loved since she was a teen. He's fighting his own demons as a suspect in his wife's murder two years earlier. Despite his past, he's determined to win Kit over once and for all. But before that can happen they need to convince the police there's a killer working his way down a list with cold-hearted vengeance in mind. Forced to delve into Alana's dark past, Jake and Kit uncover a forty-year-old double murder leading them straight to the door of a legal dynasty. Soon they find out just how far the heirs will go to keep the past buried.